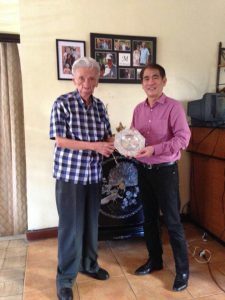 Veteran journalist Juan Mercado has finally received his silver plaque as 2014 AMIC Asia Communication Awardee three years after having been recognized by the group for excellence in journalism. Asian Media Information and Communication Centre (AMIC) secretary general Ramon Tuazon personally handed him the Selangor Plaque at Mercado’s home in Cebu City last Dec. 6. Mercado was unable to make it to the awarding ceremony held in Dubai, United Arab Emirates in June 2015. He had been set to be awarded in Bangkok, Thailand in 2014, but the ceremony there was canceled following a coup in that country. AMIC has recognized outstanding achievements in media and communication through the AMIC Asia Communication Award since 2006. Mercado was recognized for his sustained involvement in public service and observance of the highest journalistic principles. Mercado wrote columns for the Philippine Daily Inquirer, SunStar Cebu, Cebu Daily News, the Bohol Chronicle and other community papers. He began his journalism career as a reporter in Cebu in the 1950s, later becoming associate editor for Cebu and Manila newspapers. He was Manila correspondent for foreign publications including the Sydney Bulletin, Honolulu-Star Bulletin and London’s Financial Times. Mercado was founding-director of the Philippine Press Institute as well as founding director and trustee of the Press Foundation of Asia, where in the 1960s he co-founded and co-edited DepthNews, the groundbreaking service that provided development news and features to newspapers and radio stations in Asia and the developing world. He was among the journalists detained without charge when President Ferdinand Marcos declared martial law in 1972. Three years later, Mercado joined the United Nations, working as communication officer at the Food and Agriculture Organization’s Bangkok office, and then as attache d’ cabinet in the FAO Director General’s Office in Rome, Italy. After the fall of Marcos, Mercado resumed his journalism work and went on to win awards for his work from the Archdiocese of Cebu, the Province of Cebu, the Rotary Club of Manila, the Department of Science and Technology, and the Society of Publishers in Asia.